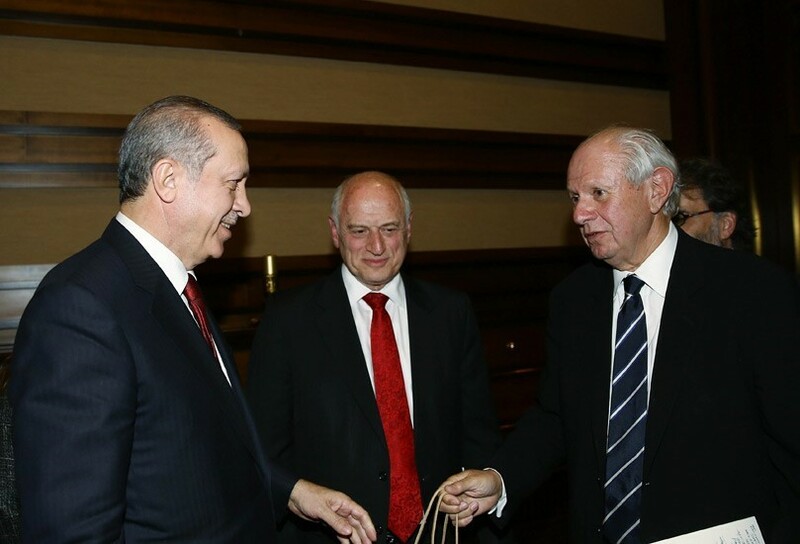 Turkish President, Recep Tayyip Erdogan, met in Ankara with a delegation of the Conference of Presidents of Major American Jewish Organizations, led by Stephen M. Greenberg, Chairman, pictured far right, and Malcolm Hoenlein, Executive Vice Chairman, center. They discussed a range of issues including relations between Turkey and the United States and Israel, terrorism and extremism, and regional conflicts. The delegation was accompanied by heads of the Turkish Jewish Community, led by Ishak Ibrahimzadeh. The far ranging discussion dealt with issues such as energy, incitement, and the role of Russia, Iran and other countries. They also talked about their commonalities as descendants of the Abrahamic faiths and multiple challenges that they face, emphasizing the need to work together to fight manifestations of hate against Jews, Muslims, Christians, and others. President Erdogan outlined eight of his policy priorities, including the issue of energy and potential for regional cooperation involving Israel as well.